The relationship between church and state is the institutional form of the relationship between the religious and political spheres. This relationship has taken a variety of forms historically and in the modern world from the state dominating religion to religion dominating the state and recent attempts to separate them. In most ancient civilizations this relationship was not clearly defined but it is one of the most significant themes running through western history. Jesus' command to "Render unto Caesar what is Caesar's, and unto God the things that are God's," (Mark 12:17) fostered the development of separate rival Church and State institutions in Christendom. This rivalry between Emperor or King and Pope was a key feature of the politics of Europe in the Middle Ages which has no parallel in other religions. One would often intervene in the realm of the other and there have been many disputes over power, property, law, education and authority. The abuse of Papal authority intensified the irreconcilable conflicts of interest and led to the secular authorities limiting the powers of religious authorities either bringing them into submission as happened in Protestant countries after the Reformation or establishing a separation between church and state as in the United States so as to guarantee freedom of religion and independence of government. In every European country church and state are intertwined in some way or another depending on the nation's history and culture. In some the church has a lot of responsibility for the provision of welfare and education; in others this has been taken over by the state. In some there are religious representatives in the legislature or the church has a special legal status and influence over certain moral issues; the state may even collect and distribute church tithes. In others there are conflicts as the state imposes secular Enlightenment-derived values on the whole of society including religious organizations, even to the point of making it illegal for them to articulate, follow and implement traditional moral values within their own communities. The state dominating and using a religion for its own purposes. This is called Erastianism and happened in Lutheran Germany and Petrine Russia where the church was a department of state and was expected to support and legitimize the government. In both countries the churches failed their prophetic responsibility to criticize the unjust actions of the state. A variant of this is caesaropapism where the king ruled both Crown and Church. Religion dominating the state. This occurred for much of western European history as the Pope, using a forged document called the Donation of Constantine, claimed that he had the authority to appoint and depose kings, and would excommunicate those who did not obey him. Theocracy, a form of government in which divine power governs an earthly human state, either in a personal incarnation or, more often, via religious institutional representatives (i.e., a church), replacing or dominating civil government. Such was the case in Calvin's Geneva and the Vatican. A state which has its own secular ideology and tries to suppress or eliminate traditional religions which it regards as false and socially subversive rivals as occurred in Communist countries. A separation of church and state in which there is religious freedom and all religions are treated equally, which is the case in the United States, and no religious body has any official influence over the state. The result can be the formation of a civil religion with a pledge of allegiance and where the symbols of the state, such as the flag, take on a quasi-religious status. The Eastern Orthodox churches conceive of the relationship between church and state as a symphony. The state defends the church by oppressing other denominations while the church supports the state by encouraging patriotism and acceptance of the state's policies. Each has its own domain in caring for the needs of the people. Islam has traditionally not made any distinction between religion and state as the ulema function as both jurists and theologians. The concept of the state is not prominent in Islamic thought for theological and historical reasons. Islam sees itself as a transnational religion. The state and religion as rival sources of authority and identity which can be in conflict with each other. This was the situation in the Roman Empire before Christianity became the official religion as well as much of medieval European history. The religious state where the ruler is believed to be god and the whole of society is orientated to the worship of the ruler and the state is seen as sacred and not secular as was the case in Ancient Egypt. In many ancient cultures, the political ruler was also the highest religious leader and sometimes considered divine. One of the earliest recorded episodes challenging a state religion of this type is the story of Moses and Aaron, confronting the king of Egypt in order, ostensibly, to win the right to hold a three-day festival honoring the Hebrew god Yahweh. According to the Book of Exodus, the Hebrews' petition was granted only after a series of miraculous plagues were visited upon the Egyptians. Moses then led the Israelites out of Egypt, never to return. 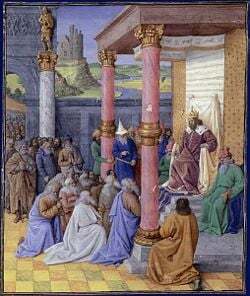 Cyrus of Persia meets with Jewish leaders returning to rebuild the Temple of Jerusalem. The first government declaration officially granting toleration to non-state religions was issued in the ancient Persian Empire by its founder, Cyrus the Great in the fifth century B.C.E. Cyrus reversed the policy of his Babylonian predecessors and allowed captured religious icons to be returned to their places of origin. He also funded the restoration of important native shrines, including the Temple of Jerusalem. Ancient Jewish tradition, on the other hand, affirmed a strict state monotheism and attempted to suppress non-Israelite religions by destroying unauthorized altars and sometimes slaughtering the priests of rival faiths. Although many of the kings of Judah and Israel in fact tolerated other religious traditions, they were condemned for this policy by the prophets and other biblical writers. In the Orient, the right to worship freely was promoted by most ancient Indian dynasties until around 1200 C.E. King Ashoka, (304-232 B.C.E. ), an early practitioner of this principle, wrote that he "honors all sects" and stated: "One must not exalt one’s creed discrediting all others, nor must one degrade these others without legitimate reasons. One must, on the contrary, render to other creeds the honor befitting them." In the West, Alexander the Great and subsequent Greek and Roman rulers generally followed a policy of religious toleration toward local religions. However, they also insisted that indigenous peoples pay homage to the state religion as well, a policy which put monotheistic faiths such as Judaism in a position of either compromising their own principles or rebelling against the state's authority. The Jews rebelled against enforced Hellenization in Macabeean revolt of the second century B.C.E. The Ancient Romans tolerated Jewish non-compliance with the requirement to honor the gods of the state. The Roman state saw itself as the ultimate authority and locus of law and loyalty with an Emperor who claimed divinity and expected to be worshipped. The Christian Church, which only appeared much later, recognized the necessity of the state in the maintenance of law and order but could not accept its claim to be sacred or to have authority over morality or people's souls. The Christian attitude toward the state was based on Jesus' teaching that one should “render to Caesar the things that are Caesar's, and to God the things that are God's” (Mark 12:17). It saw itself as having the authority to determine what was God's law and expected people to put obedience to God and the Church above obedience to civil law and the Emperor. After a period of conflict, Christianity was made the official religion of the Roman Empire so as to unite and reinforce it. Both state and church each had their own, sometimes overlapping, spheres of influence over people, one temporal and the other spiritual. The Emperors had considerable authority over Church doctrine and discipline while trying to incorporate Christian principles into civil law. Constantine the Great, mosaic in Hagia Sophia, c. 1000. 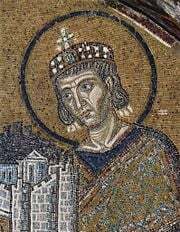 The Emperor Constantine I established a precedent for the position of the Christian Emperor in the Church. Constantine was looking for a religion that could unify the empire in a way that the old Roman religion could not. He thought Christianity could fulfill this role and in 313 proclaimed the Edict of Milan, which removed penalties for professing Christianity and returned confiscated Church property. He considered himself responsible to God for the spiritual health of his subjects, and thus a duty to maintain orthodoxy. When he discovered that Christians themselves were in sometimes violent disagreement about their beliefs thus causing problems within the empire, he summoned and chaired the Council of Nicaea, in 325 to deal with the heresy of Arianism. By doing so he forced the church to define itself by a creed and used the power of the state to enforce orthodoxy. Up until this time the church had rarely made such decisions and did not have the power to persecute heretics. That the church allowed an unbaptized emperor to do so changed the relationship between church and state. The Eastern Orthodox churches sometimes refer to Constantine as the "13th Apostle" so great was his influence on the Church. The idea that the Emperor is head of the church as well as the state is known as Caesaropapism. Christianity became the official state religion under Theodosius I in the early fifth century C.E. The later Roman Empire under Christianity repressed non-Christian religions and Christian heresies alike. Jews, too, suffered under the influence of Christian bishops such as Ambrose of Milan, who prevailed in his opinion that a Christian emperor must not compel a local bishop to pay for the rebuilding of a synagogue he had led his parishioners to destroy. This precedent was also an important one for asserting the independence of the Western church from the state. Under the influence of Saint Augustine of Hippo, the Western church viewed the state as a "secular" power whose role was to uphold Christian law and order and to punish those who do evil. (Augustine's teaching is the origin of the term "secular," by which he referred to the period prior to Christ's second advent.) The Eastern church took a different view, seeing a positive role for the state as God's agent in society. A third course would be adopted in lands affected by the rise of Islam, which recognized no distinction between religion and the state. In the eastern Byzantine Empire, the emperors, although sometimes deferring to powerful bishops and monks on matters of theology, considered themselves to be the "supreme pontiff" of the Church, as well as head of state. 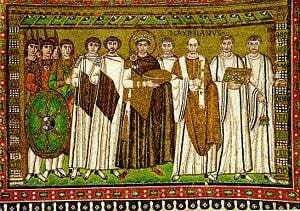 Justinian I promulgated the doctrine of harmonia, which asserted that the Christian state and the Church should work together for God's will on earth under the emperor's leadership. A strong supporter of Orthodoxy and opponent of heresy, Justinian secured from the bishops in attendance at the Second Council of Constantinople in 553, an affirmation that nothing could be done in the Church contrary to the emperor's will. This doctrine remained in effect until the Ottomans conquered Constantinople (now Istanbul) in the fifteenth century. There are two powers, august Emperor, by which this world is chiefly ruled, namely, the sacred authority of the priests and the royal power. Of these that of the priests is the more weighty, since they have to render an account for even the kings of men in the divine judgment. You are also aware, dear son, that while you are permitted honorably to rule over humankind, yet in things divine you bow your head humbly before the leaders of the clergy and await from their hands the means of your salvation. Purportedly issued by the fourth century Roman Emperor Constantine I, the Donation of Constantine granted Pope Sylvester I and his successors, as inheritors of Saint Peter, dominion over the city of Rome, Italy, and the entire Western Roman Empire, while Constantine would retain imperial authority in the Eastern Roman Empire from his new capital of Constantinople. On the basis of this document the Pope and his representatives claimed the authority to appoint and crown kings suggesting that all temporal authority had to be legitimized by the Church. The Italian humanist Lorenzo Valla proved in 1440, that the Donation was a fake by analyzing its language, and showing that certain phrases were anachronistic and that the purported date of the document was inconsistent with the content of the document itself. However, the Vatican placed Valla's work on the list of prohibited books, and defended the document's authenticity. It continued to be used as genuine until Baronius in his "Annales Ecclesiastici" (published 1588-1607) admitted that the "Donation" was a forgery, and eventually the church conceded its illegitimacy. The Donation of Constantine was probably forged between 750 and 850. The precise purpose of the forgery is not entirely certain, but it was clearly a defense of papal interests, perhaps against the claims of either the Byzantine Empire, or the Frankish king Charlemagne, who had assumed the former imperial dignity in the West and with it the title "Emperor of the Romans." The earliest date is the most probable, and it is often said that the document could have been written during the papacy of Stephen II. It has been suggested that an early draft was made shortly after the middle of the eighth century in order to assist Pope Stephen II in his negotiations with Pepin the Short, the Frankish Mayor of the Palace. In 754, Pope Stephen II crossed the Alps to anoint Pepin king, thereby enabling the Carolingian family to supplant the old Merovingian royal line. 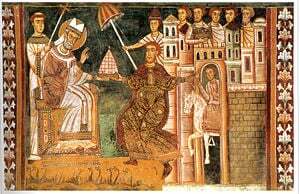 In return for Stephen's support, Pepin apparently gave the Pope the lands in Italy which the Lombards had taken from the Byzantine Empire. These lands would become the Papal States and would be the basis of the Papacy's secular power for the next eleven centuries. Inserted among the twelfth-century compilation known as the Decretum Gratiani, the document continued to be used by medieval popes to bolster their territorial and secular power in Italy. It was widely accepted as authentic, although the Emperor Otto III did denounce the document as a forgery. In Europe, the supremacy of the pope faced challenges from kings and western emperors on a number of matters, leading to power struggles and crises of leadership, notably in the Investiture Controversy of the eleventh century over the question of who had the authority to appoint local bishops. The reason the kings wanted to be involved was that the church owned and controlled vast areas of land and so the bishops had great economic and thus political power. A see-saw battle ensured during the succeeding centuries as kings sought to assert their independence from Rome while the papacy engaged in various programs of reform on the one hand and the exercise of considerable power against rebellious kings on the other, through such methods as excommunication and interdicts. In England there was a clash between church and state over the legal jurisdiction. King Henry II wanted the clergy to be tried in civil courts and not church courts on the basis that everyone should be judged by the same law and receive the same punishment. The problem was that clergy who committed even crimes such as murder were being judged very leniently by the ecclesiastical courts, which was seen as unfair. The Archbishop of Canterbury, Thomas Becket disagreed as he wanted to defend the independence of the church. Henry VIII asserted royal authority over the church in England. During the Renaissance, nationalist theorists began to affirm that kings had absolute authority within their realms to rule on spiritual matters as well as secular ones. Kings began, increasingly, to challenge papal authority on matters ranging from their own divorces to questions of international relations and the right to try clergy in secular courts. This climate was a crucial factor in the success of the Protestant Reformation. 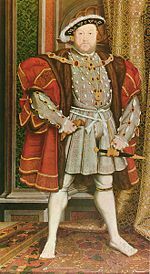 In England Henry VIII established himself as head of the Church of England. He went on to dissolve the monasteries and confiscate much church land which he redistributed to his supporters. The result was the destruction of the country's welfare provision. Protestant churches were just as willing as the Catholic Church to use the authority of the state to repress their religious opponents, and Protestant princes often used state churches for their own political ends. Years of religious wars eventually led to various affirmations of religious toleration in Europe, notably the Peace of Westphalia, signed in 1648. In England, after years of bloodshed and persecution on all sides, John Locke penned his Essays of Civil Government and Letter Concerning Toleration. These seminal documents in the history of church and state played a significant role in both the Glorious Revolution of 1688 and later in the American Revolution. The Declaration of the Rights of Man and of the Citizen guarantees freedom of religious opinion. Locke wrote: "The care of souls cannot belong to the civil magistrate, because his power consists only in outward force; but true and saving religion consists in the inward persuasion of the mind, without which nothing can be acceptable to God." 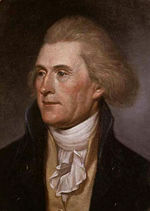 Thomas Jefferson's Virginia Statute for Religious Freedom is considered a pioneering model for modern religious freedom legislation. The French Declaration of the Rights of Man and of the Citizen (1789) likewise guaranteed that: "No one shall be disquieted on account of his opinions, including his religious views, provided their manifestation does not disturb the public order established by law." The U.S. Constitution’s Bill of Rights, passed in 1791, specifically banned the American government from creating a state religion, declaring: "Congress shall make no law respecting an establishment of religion, or prohibiting the free exercise thereof." In practice, the French Revolution took a somewhat different attitude from its American counterpart regarding the question of religious liberty. In the French case, not only would the state reject the establishment of any particular religion, it would take a vigilant stance against religions involving themselves in the political arena. The American tradition, on the other hand, welcomed religious arguments in public debate and allowed clergymen of various faiths to serve in public office as long as they adhered to the U. S. Constitution. The French leadership, having suffered from centuries of religious wars, was also deeply suspicious of religious passion and tended to repress its public expression, while the Americans adopted a positive attitude toward newer and smaller faiths which fostered a lively religious pluralism. These two approaches would set the tone for future debates about the nature and proper degree of separation between church and state in the coming centuries. Many variations on relationship between church and state can be seen today. Some countries with high degrees of religious freedom and tolerance have still maintained state churches or financial ties with certain religious organizations into the twentieth century. England, for example, has an established state religion but is very tolerant of other faiths as well. In Norway, similarly, the King is also the leader of the state church, and the twelfth article of the Constitution of Norway requires more than half of the members of the Norwegian Council of State to be members of the state church. Yet, the country is generally recognized to have a high degree of religious freedom. In countries like these, the head of government or head of state or other high-ranking official figures may be legally required to be a member of a given faith. Powers to appoint high-ranking members of the state churches are also often still vested in the worldly governments. 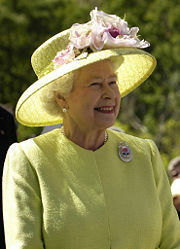 Elizabeth II, Queen of England, is also Governor of the Church of England. Several European countries such as Germany, Austria, and several Eastern European nations officially support large religions such as the Catholic Church, Lutheran (Evangelical) Church, or the Russian Orthodox Church, while officially recognizing other churches as legitimate, and refusing to register newer, smaller, or more controversial religions. Some go so far as to prohibit unregistered groups from owning property or distributing religious literature. In most European countries churches are involved in education. In the UK religious education is compulsory in all state schools. There are many Church of England and Catholic schools which are funded by the state and recently Sikh and Hindu schools have received the same status. In Germany Lutheran ministers and Catholic priests teach confessional religious education in public schools. Other countries maintain a more militant brand of separation church and state. Two prominent examples are France and Turkey. (Turkey's policy has changed somewhat in recent years with the advent of a less-secularist government.) The French version of separation is called laïcité. This model of a secularist state protects the religious institutions from some types of state interference, but public expression by religious institutions and the clergy on political matters is limited. Religious minorities are also limited from expressing themselves publicly by wearing distinctive clothing in the workplace or in public schools. The opposite end of the spectrum from separation of church and state is a theocracy, in which the state is founded upon the institution of religion, and the rule of law is based on the dictates of a religious court. Examples include Saudi Arabia, the Vatican, and Iran. In such countries, state affairs are managed by religious authority, or at least by its consent. In theocracies, the degree to which those who are not members of the official religion are to be protected is usually decided by experts of the official religion. A special case was seen in Marxist-Leninist countries, in which the state took a militantly atheistic standpoint and attempted, by varying degrees, to suppress or even destroy religion, which Karl Marx declared as the "opiate of the people" and a tool of capitalist oppression. Some have argued that in Marxist states, the ideology of Marxism-Leninism constituted a kind of atheist religion, and that such states in fact do not separate "church and state" but replace a theistic state religion with an atheistic one. While Marxist-Leninist states today are rare, North Korea still officially holds to this ideology and China still adopts a hostile attitude toward various religious groups based in part on the Marxist attitude of its leaders. The advent of Islam created another attitude toward the relationship between religion and the state. Theoretically, Islam sees no distinction between religion and the state. The ideal function of the state in Islamic tradition is to uphold the Sharia, or Islamic law. In practice, however, governments in Islamic countries encompass a wide spectrum of attitudes toward the relationship between religion and the state. Islamic lands generally recognized no distinction between religious and secular government until the period of the Ottoman Empire beginning with Osman I in the early fourteenth century. Islamic lands were ruled by the Islamic codes, or Sharia, usually under a caliph as the supreme political leader. Although forcible conversions of non-Muslims were allowed in some circumstances, Islamic law guaranteed the rights of both Christians and Jews to worship according to their own traditions. Thus, Christians were usually granted greater religious freedom in Muslim lands than Muslims were granted in Christian countries; and Jews generally fared better under Muslim rulers than Christian ones. Islam generally holds to principle that both Judaism and Christianity, being religions inspired by Allah, should be tolerated and protected by the state. However, these religions must not attempt to convince Muslims to convert; their adherents have fewer civil rights that Muslims; their men often cannot marry Muslim women; and they are to be taxed more heavily than Muslims. 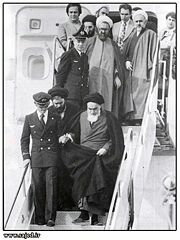 Ayatollah Ruhollah Khomeini returns to Iran to set up his version of an Islamic republic. Certain passages in the Qur'an allow for adherents of other religions—deemed to be infidels—to be forcibly converted to Islam, while other verses declare that there is to be "no compulsion in religion." No governments of Islamic lands hold to the stricter interpretation, but movements such as the Taliban in Afghanistan and Al Qaeda in Iraq attempt to enforce it. Some governments, such as that of Turkey, are firmly secularistic and even ban Islamic dress in government jobs and schools. Most Islamic governments actually provide for religious freedom for religions other than Christianity and Judaism, such as Hinduism, Buddhism, and many others. Nevertheless, since the demise of the Soviet Union, Islamic countries today generally have a poor record compared to other nations, in terms of allowing religious freedom to their citizens. A Caliphate in Sunni Islam—The head of state in this system is the Caliph, a successor to Muhammad's political authority. No such governments exist today. The restoration of the Caliphate is one of the stated goals of certain Islamic fundamentalist groups, including the Al-Qaeda terrorist organization. An Imamah in Shia Islam—This is essentially the Shia version of the Caliphate, centering specifically on the bloodline of Ali. A Wilayat al-Faqih for the Shia in the absence of an Imamah—This normally refers to role of the Islamic courts or a supreme Islamic leader such as the Ayatollah Khomeini as the interpreters and guardians of the Shari'a. An Islamic republic—This is a general term for the governmental system in many nation states who adopt Islam as a religion. However, it is best known today in the case of Iran, which is a particular form of Islamic republic along Shia fundamentalist lines. Islamic republics and/or other governments in majority Islamic countries are often ruled by a system of representative government, but they differ from Western democracies in that the courts are usually specifically Islamic courts, ruling according to Shari'a law, while the democratically elected parliaments deal with legislation of a secular nature. In western democracies that practice the principle of separation of church and state, the courts are strictly forbidden from enforcing religious law, but must adhere to the constitution or laws enacted by the legislature. "Separation of Church and State" is often discussed as a political and legal principle derived from the First Amendment of the United States Constitution, which reads, "Congress shall make no law respecting an establishment of religion, or prohibiting the free exercise thereof…"
However, there are inevitable entanglements between the institutions of religion and the state, inasmuch as religious organizations and their adherents are a part of civil society. Moreover, private religious practices can sometimes come into conflict with broad legislation not intending to target any particular religious minority. Examples include laws against polygamy, animal sacrifice, hallucinogenic drugs; and laws requiring the swearing of oaths, military service, public school attendance, etc. Each of these complicate the idea of absolute separation. 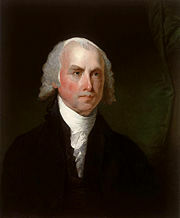 Another early user of the term was James Madison, the principal drafter of the United States Bill of Rights, who wrote of the "total separation of the church from the state." The United States Supreme Court has referred to the separation of church and state more than 25 times since 1878. The term was used and defended by the Court until the early 1970s. Since that time, the Court has distanced itself from the term somewhat, often suggesting the metaphor of a "wall of separation" conveys hostility to religion in contrast to Jefferson's original meaning "…in behalf of the rights of [religious] conscience." Separation of church and state can thus occur in various ways and to various degrees. In practice, the principle has not been a simple one. Nor should separation of church and state be considered as synonymous with "separation of religion and politics." Both on the large issues and the details, a wide variety of policies can be found on church-state questions, both in the western democracies and nations committed to other political models such as Islamic government and Marxism. 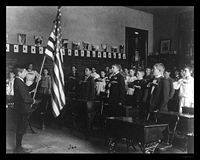 U.S. schoolchildren recite the Pledge of Allegiance. Whether the state should officially establish a religion. State religions exist in relative free countries such as the England, as well as relatively unfree countries such as Saudi Arabia, as well as countries with a mixed record on religious and political freedom, such as Israel. Whether the state should act in a way that tends to favor certain religions over others, or which favors a religious attitude over a non-religious one. For example, is it better to encourage prayers in public schools, or to protect the rights of those students who might feel uncomfortable with certain types of prayers. Whether the state should officially fund religious activities or schools associated with religious bodies. For example, should taxes go to pay the salaries of mainstream ministers, as they do in Germany and some other European countries today, or to aid non-religious education in Catholic schools. Whether the state should indirectly fund religious activities such as voluntary prayer meetings and Bible studies at public schools or religious displays on public properties. Whether the state should fund non-religious activities sponsored by religious organizations. For example, should the government support "faith-based" charitable programs to feed the hungry. Whether the state should not prescribe, proscribe, or amend religious beliefs. For example, can the state require students to say the words "under God" when pledging allegiance to their country; and can it prohibit preachers from giving sermons that denigrate homosexual acts as sinful? Whether the state should endorse, criticize, or ban any religious belief or practice. For example should the state prohibit the wearing of distinctive religious clothing, the practice of animal sacrifice, or the refusal by parents to accept medical treatment for their children? Should it ban the preaching of violent jihad against non-Islamic regimes? Whether the state should interfere in religious hierarchies or intervene in issues related to membership. This becomes a question, for example, when members of a religious congregation sue a religious institution for control of assets or for damages resulting from the behavior of religious officials, such as sexual abuse by priests. Whether a state may prohibit or restrict religious practices. Examples include polygamy, circumcision, female genital mutilation, animal sacrifices, holding prayer meetings in private homes, fundraising in public facilities, and evangelizing door to door. U.S. 20-dollar bill with the slogan "In God We Trust"
Whether the state may express religious beliefs. Is it appropriate for the state to print "In God We Trust" on its currency, to refer to God in its national anthem, or to cause its leaders to swear public oaths to God before assuming office? Whether political leaders may express religious preferences and doctrines in the course of their duties. Whether religious organizations may attempt to prescribe, proscribe, or amend civil or common law through political processes open to other institutions. Some nations forbid religions from supporting legislation, others limit it to a percentage of the religion's financial activity, and others place no restrictions on such activities. Whether religions may intervene in civil political processes between the state and other nations. Specifically does a church have the right to be a party in official international forums, as other non-governmental organizations do. Whether religious institutions may actively endorse a political figure, or instead limit themselves to moral, ethical, and religious teaching. Some countries ban churches from political activity altogether; others impose penalties such as the loss of tax exemption for such actions; and state religions often actively endorse or oppose political candidates. There will always be tension in the relationship between church and state as the spiritual culture of a country changes. At times the churches will be able to have religious moral values enshrined in legislation. At other times it will be secular values that will predominate. In some ways the relationship could be compared to that of a well-ordered mind and body. The church should provide the spiritual and moral values that should inform the public life of a country and be embodied in its legislation giving it a sense of purpose or vision. ↑ Adrian Karatnycky, Religious Freedom and Democracy as Fundamental Human Rights, religiousfreedom.com. Retrieved August 17, 2007. ↑ Zorach v. Clauson, 343 U.S. 306, 312 (1952). ↑ James Madison, "1819 letter to Robert Walsh". constitution.org. Retrieved October 13, 2008. Beneke, Chris. Beyond Toleration: The Religious Origins of American Pluralism. Oxford University Press, 2006. ISBN 0195305558. Cochran, Clark, and Derek Davies. Church, State and Public Justice: Five Views. IVP Academic, 2007. ISBN 978-0830827961. Church, Forrest. 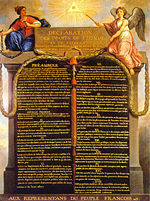 The Separation of Church and State: Writings on a Fundamental Freedom by America's Founders. Boston: Beacon Press, 2004. ISBN 978-0807077221. Feldman, Noah. Divided by God: America's Church-State Problem—and What We Should Do About It. Farrar, Straus and Giroux, 2006. ISBN 978-0374530389. Grasso, Kenneth. Catholicism and Religious Freedom: Contemporary Reflections on Vatican II's Declaration on Religious Liberty. Lanham, MD: Rowman & Littlefield Publishers, Inc., 2006. ISBN 978-0742551930. Hamilton, Marci. God vs. the Gavel: Religion and the Rule of Law. Cambridge University Press, 2005. ISBN 0521853044. Madeley, John & Zsolt Enyedi, eds. Church and State in Contemporary Europe: the chimera of neutrality. London: Frank Cass Publishers, 2003. ISBN 0714683299. Wampler, Dee. The Myth of Separation Between Church & State. Winepress Publishing, 2003. ISBN 978-1579216238. Americans United for Separation of Church and State. www.au.org. Separation of Church and State, Anti-Defamation League (Jewish). www.adl.org. Freedom from Religion Foundation. www.ffrf.org. Seventh-day Adventist Church State Council. www.churchstate.org. The Becket Fund for Religious Liberty. www.becketfund.org. History of "Church and State"